Under Armour Introduces Global Innovation Hub For Footwear Design In Portland, OR | Under Armour, Inc.
PORTLAND, Ore., Sept. 14, 2017 /PRNewswire/ -- Today, Under Armour introduced its newest center for performance innovation in Portland, OR, bringing footwear design and development under one roof. To assist the company's most significant push in the footwear business to date, the new innovation hub includes a forward-looking biomechanics lab and performance training center for athlete testing. 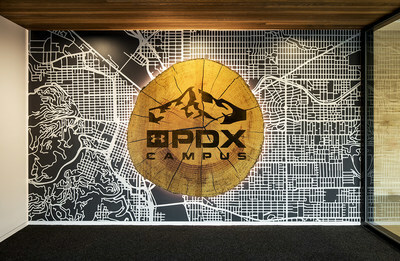 The Under Armour Portland office (UA PDX) is home to the design, development and innovation teams, about 100 teammates, that are creating the company's next generation Basketball, Running, Training, Golf, Sportstyle and Outdoor footwear. The 70,000 square foot building sits in Southwest Portland adjacent to the recently refurbished Duniway Park, and at the site of a former YMCA facility. "Footwear is a key driver of our long-term growth and success," said Peter Ruppe, Sr. Vice President for Footwear at Under Armour. "We've established a strong foundation, and now UA PDX represents a considerable leap forward towards creating leading performance footwear designed to make athletes better." Under Armour has also begun to establish roots in the Portland community beyond the UA PDX facility. The company played a key role in refurbishing and updating the sports fields, running tracks and trails at Lents and Duniway Parks in downtown Portland. Under Armour is steadfastly devoted to developing best-in-class products while working closely with the communities in which its teammates live and operate. Under Armour (NYSE: UA, UAA), a leader in the performance footwear, apparel and equipment industries, revolutionized how athletes across the world dress. Designed to make all athletes better, the brand's innovative products are sold worldwide to athletes at all levels. The Under Armour Connected Fitness™ platform powers the world's largest digital health and fitness community through a suite of applications: UA Record, MapMyFitness, Endomondo and MyFitnessPal. The Under Armour global headquarters is in Baltimore, Maryland. For further information, please visit www.uabiz.com.